The Focus RS is Ford’s entre into the modern rally sport compact market. Designed to compete against the Subaru WRX and the Volkswagen Golf R, the Focus RS exceeded all expectations by easily besting its rival. Powered by a torquey 2.3 liter turbocharged 350 HP, 4 Cylinder GTDI Engine, and mated to a smooth shifting 6-Speed Manual Transmission mated to a computer controlled torque vectoring all wheel drive system, the car offers supercar performance at a reasonable price point. With Zero to 60 coming up in only 4.6 seconds and a top speed of 165 mph, the Focus RS offers performance matched only by the most expensive exotic cars in the world. Well appointed and featuring great build quality and engineering, the car has become one of the darlings of the automotive world. 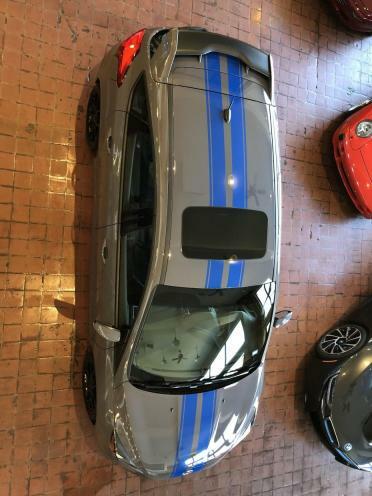 These are rare cars The car on offer here is a 2017 Ford Focus RS AWD in superb mechanical condition and is covered by the bumper to bumper Ford factory warranty. The car is Stealth Gray over Ebony and had an original sticker price of more than $43,000 MSRP. The exterior is a stunning Stealth Gray finish complemented by the Ebony Black Partial Leather Recaro Seats interior. Both the exterior and interior are in superb condition. The car has a blue vinyl racing stripe; easily removed if desired. 2017 Ford Focus RS AWD : RS2 PKG, NAV, CAM, SUNROOF, HTD STS, KEYLESS GO, BLUE CLPRS, XENON, 19IN BLACK WLS, MANUAL, $6K OPTIONS | Equipment Group 600A, RS2 Package $2,785, 19" Prem Painted Black Forged Alloy Wheels $1,990, Power Sunroof $895, Blue Painted Calipers, Unique RS Rear Spoiler, Backup Camera, Bluetooth Hands-Free, Cruise Control, HD Premium Audio, Heated Seats, Heated Steering Wheel, Keyless Entry, Keyless Go, Leather Seats, Multi-Zone Climate Control, Navigation, Portable Audio Connection, Satellite Radio, Security System, Side Curtain Airbags, Steering Wheel Controls And Xenon are just a few of the luxurious features this 1 Owner car.